If I remember it well, the first rap record that I ever heard was Rappers’delight by The Sugar Hill Gang. It was in 1979, in a tourist discotheque, and I didn’t like it at all. I thought it was not a song and definitely not something to dance to. But a little later, when Grandmaster Flash & Melle Mel had a hit with The message , I was converted into rap. But there were not many records available in those days, and they all sounded the same. Many even used the same instrumental tracks. And after a while rap seemed to be a short craze, like the hullygully and the boogaloo. Years later I heard Doug E. Fresh on the radio and the next morning I bought his 12 inch, The show . That was the only 12 inch record that I ever bought new. A little later I discovered L.L. Cool J.’s LP Radio , and that was one of the marking points in my life. Radio has been one of the most played records on my record player. I have been a close follower of rap until the rap became to violent and stupid for my taste. For a long time I was hoping that I could hear some recordings of the early days of rap, when pioneers like DJ Kool Herc were inventing the hiphop. But the more I read and hear about those early days of hiphop and rap, the less I think I want to hear it. I am afraid that it will sound very much like the Sugar Hill Gang and Joe Bataan. In the record collection that I got from Alex Sas, are a hand full of 12 inch records with early raps. Ofcours there is The Sugar Hill Gang, Joe Bataan and Jocko, but also a few names that I didn’t know. 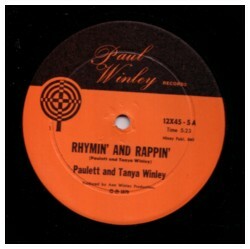 Like Funky Four Plus One More, Sicle Cell & Rhapazooty and Paulett & Tanya Winley. When I did a Google search, I discovered that these records are pretty rare and expensive. But they all sound like the Sugar Hill Gang! 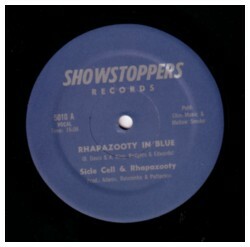 Here is an excerpt from Rhapazooty In Blue by Sicle Cell & Rhapazooty. If you want to hear more, make me an offer I can’t refuse and I send you the original records. 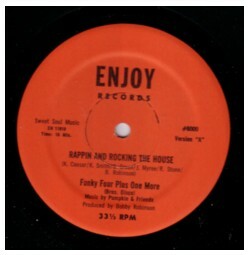 The Funky Four Plus One More songs are 14 and 16 minutes long! That is about 11 and 13 minutes too long for my attention span.